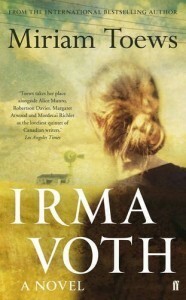 I read Irma Voth to fulfill the I obligation in my A-Z CanLit Challenge, going with the title instead of the author’s name this time. A little while ago, I read All My Puny Sorrows and loved it, so I thought it would be fun to read another Miriam Toews book. Irma Voth is the second child of a dysfunctional Mennonite family that has moved from Canada to a Mennonite community in Mexico. Opening line: Jorge said he wasn’t coming back until I learned how to be a better wife. Right away, we know that Irma’s husband makes her feel bad about herself. Then, soon after, we find out that her father mistreats her as well. When she marries Jorge, a Mexican boy, at the age of 19, her father shuns her, and makes it hard for her to come home to visit her mother. With her husband gone for an indeterminate amount of time, Irma is left with her 13-year-old sister, who comes to visit Irma against their father’s wishes. A film crew comes to their Mennonite community, and Irma is hired as a translator. Her sister, Aggie, wants to join in, too. The filming of the movie has disrupted the community, and angered Irma’s father. In the end, Irma decides the best thing to do is run away with her sister. At such a young age, Irma is loaded with responsibilities and burdens. I took a notebook out of my pocket and made a list of troubling things. Aggie is now my responsibility. Aggie has to go to school, at least in the fall. But where? We have hardly any money. Jorge might never come back. Our father is going to sell the house. I have to get a map. We’ll have no place to live. We’ll have to stand silently by the road like that Tarahumara family. Forever. Irma and Aggie find themselves alone in Mexico City with no money, no place to live, and no job. But strangers are kind to them. There are many secondary characters in this book who add so much colour to the story; the people on the film crew who accept Irma for who she is; Gustavo, the cab driver, who takes Irma and Aggie to the beach and makes them laugh; Noehmi, who befriends them on their first night in Mexico City; Hubertus and Nathalie, who take them in and give Irma a job. Irma Voth is the narrator of her own story. Her voice reminded me a lot of Yoli, the narrator in All My Puny Sorrows, but her story is very different. Irma and Aggie are much younger. They are running from a strict, stern father, and are carrying with them a couple of big, dark secrets. They are too young for the lives they are leading, but have to figure out how to live them anyway. 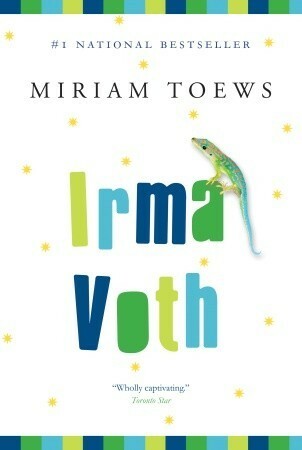 Irma Voth is a quirky story full of courage, anger, confusion, tenderness, and secrets. But, ultimately, it is about forgiveness. How do we forgive ourselves and others in order to find peace and move on? I had one question of myself: how do I preserve my dignity when nobody else is watching? By believing in a happy ending, I told myself. I posed another question to myself. How do I behave in this world without following the direction of my father, my husband or God? Does it all end with me sleeping in a barn with cows and creeping around the campo spying on people from the roofs of empty grain sheds? … I told her that she wasn’t going home again, that home had changed, that home, like thoughts, according to Marijke, were random patterns of atoms flying around and forever on the move. And I considered telling her that if thoughts and home were random patterns than actions were too, all actions, tender, desperate, lucid, treacherous ones and the promises we make and break, the secrets we share with dying Venezuelans, and the bruises and bleeding cuts on her back. All of them random patterns. And that they didn’t mean a thing. Is it possible to communicate loneliness if the only person you’re sharing it with is yourself? I wanted to describe to her the way Katie rebelled, with jokes and smiles and affection and with some kind of tragically naïve understanding that it would all be fine and even fun and definitely, ultimately, forgivable. It feels good to make plans with a baby. They seem a little more flexible then the plans we make with people who remember making them. After reading three books by Miriam Toews, I wonder: has she written any that show the Mennonite families and communities in a good light? Has she written any books that don’t involve them at all? So far, the three narrators have been women/daughters/sisters from one of these families who are coming of age or struggling with past and present events, using humour and wit to come to terms with their lives. I have liked all of them, and am now curious to find out if these same themes play out in all of her books. Interesting! I don’t think I’ve ever read a novel that involved Mennonite communities. If you are ever interested in reading one, look up Miriam Toews! Thanks to your reviews, I will! Great review! I will be adding this to my list of books to read. Thank you! I hope you like it! And, if you do, Miriam Toews has read several other books you might like. Oh great! 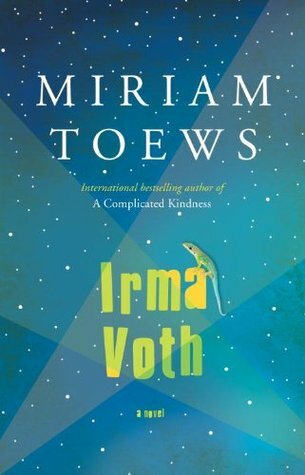 I actually have a copy of A Complicated Kindness on my shelf so I’ll be sure to read that before dipping into Irma Voth. Thanks for the suggestion!